The BMP (biomethane potential) test system „Yieldmaster“ is a sophisticated and modular analysis system. 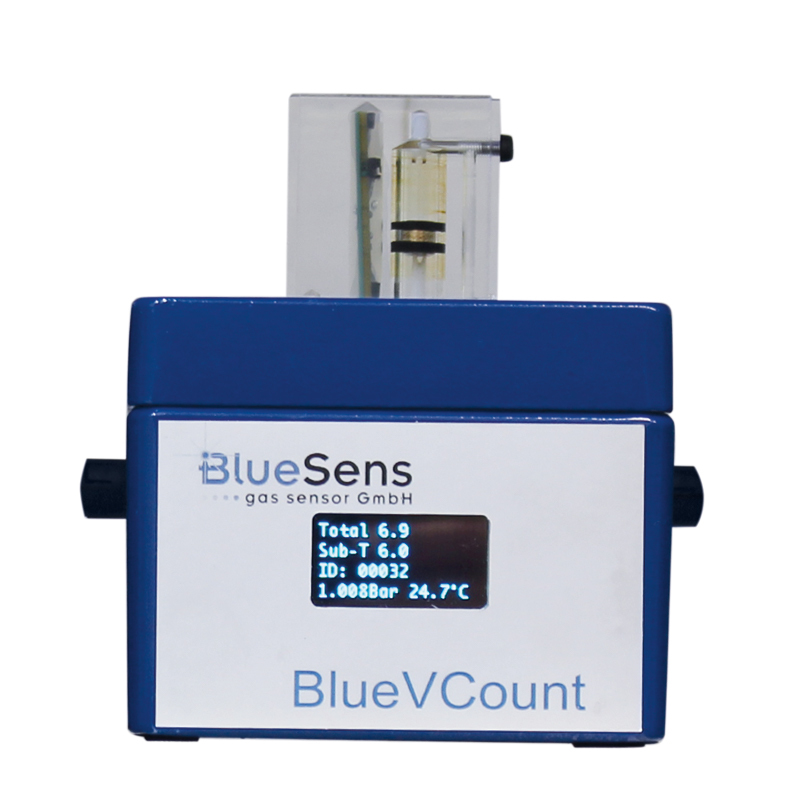 In its basic setup it consists of a gas bottle connected via tubing to our precision gas volume measurement device, named BlueVCount. It measures up to 80ml/min with a resolution of 1ml and consists of a volume measurement cell as well as temperature and pressure sensor. The volume measured of every single device is given as norm volume (273,15K 1,013 bar). Additionally humidity can be compensated when necessary. 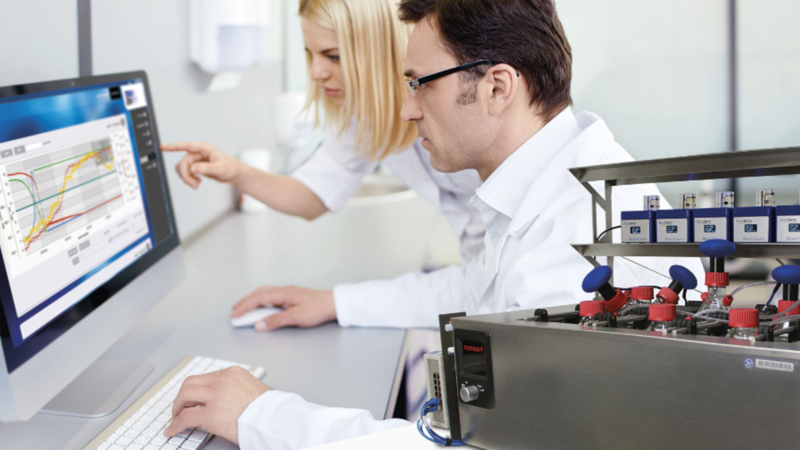 For more advanced research tasks at universities or other research institutes the basic setup can be extended to also measure the gas concentration. 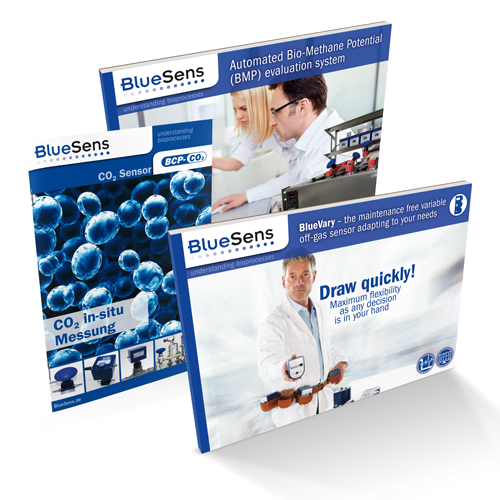 Here we offer the well-known BCP gas analyzers for determination of CH4, CO2, H2, or O2. Direct installation at the fermentation vessel enables highly precise results and headspace corrections according to VDI 4630. Furthermore kintec investigations of different substrate are feasible. 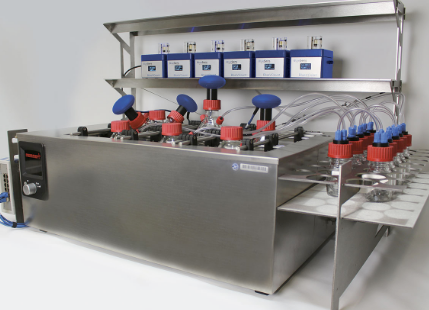 Additional equipment like water bath, stirring, different glass reactors (250-5000ml), pH electrodes and pumps may be connected and controlled applying our cost effective open bioprocess software BlueVis. To ensure that the biogas production is very effective it is necessary to know the biological methane potential (BMP) of the input material. The Yieldmaster will make it easy for you to see find out the BMP of different substrates and to guarantee the maximum yield for your biogas process. 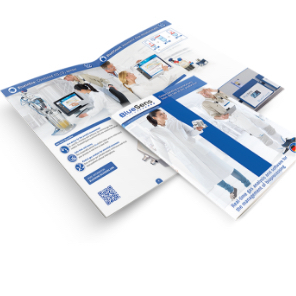 When using the biomethane potential analyzer Yieldmaster you do not have to consider minimum gas volumes produced during the running experiment. As the experiment is started, the CH4 concentrations and the gas volumes are recorded automatically. We can also offer a preconfigured Yieldmaster complete system with BlueVis, a very powerful PC, a monitor, mouse and water-resistant keyboard. 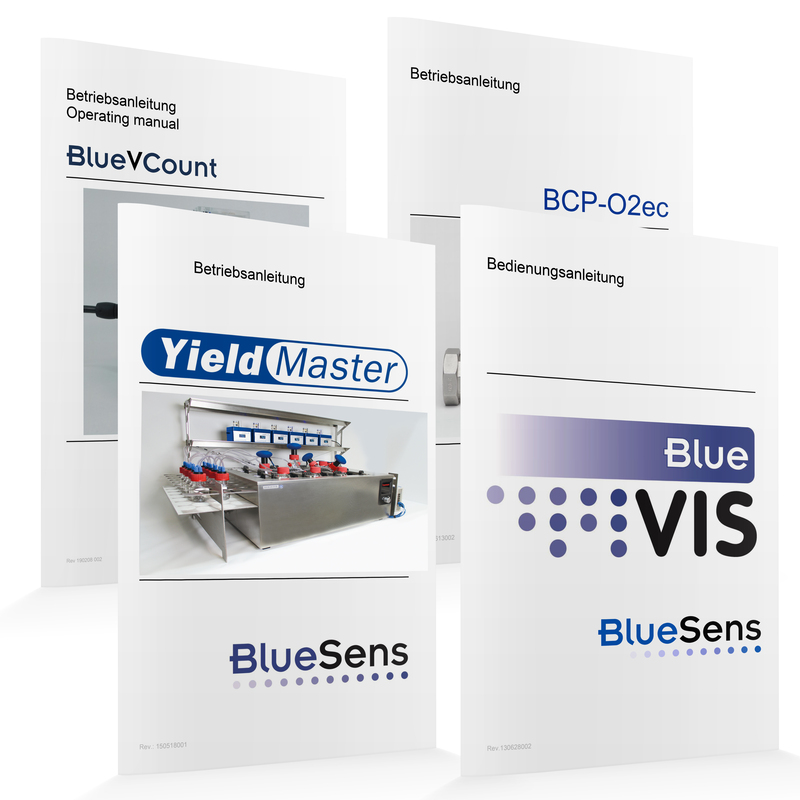 The Yieldmaster complete system is individually pre-installed for you at BlueSens so that you can quickly start the measurement. Just contact us for the complete system with PC. 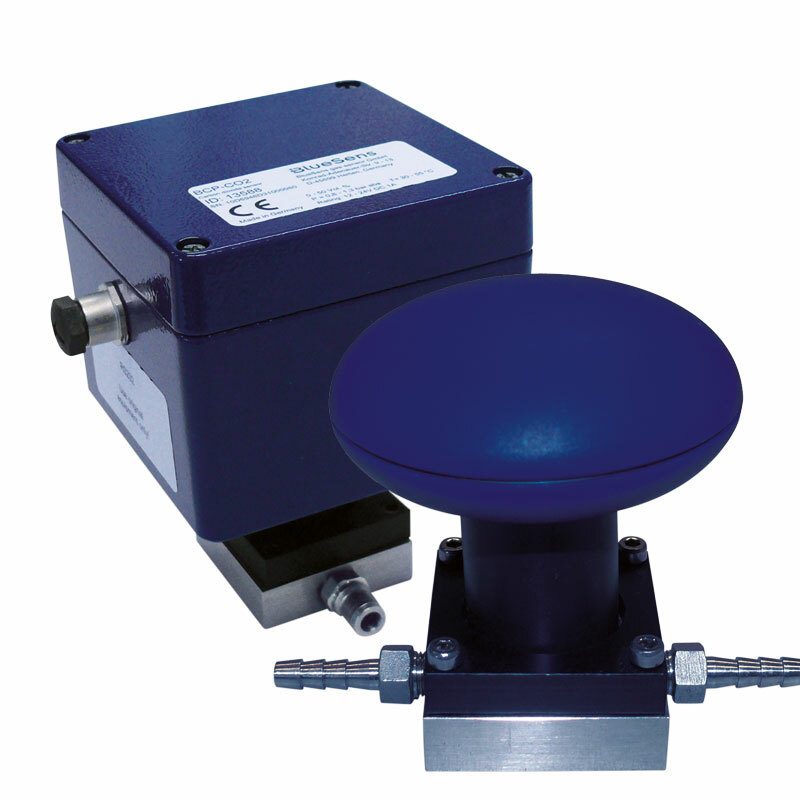 volumetric meter up to 80 ml/min at a resolution of 1ml, integrated temperature and pressure sensor for automated normalisation of the measured volume. Especially for use in the Yieldmaster systems there is a special flow adapter for use along with inexpensive preserving jars to choose from now. 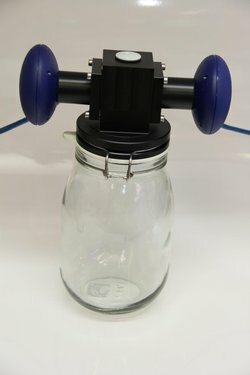 The flow adapter can be easily connected to round jars with a volume of up to five liters and provides two connectors for BCP-sensors. In most cases the set-up consists of a CH4 and a CO2 sensor, but for other types of experiments there are other possible installations (for example, CH4 / O2 or CH4 / H2). In addition, the flow adapter has a standardized PG13.5 port through which, for example, an additional probe can be installed. The experiments for the production of Biomethane often last for several days. Often it is recommended to run a larger number of experiments at the same time run enough variations and comparison tests in a manageable timeframe. The use of inexpensive jars in this case represents an attractive alternative to traditional fermentation vessels and small fermenters.